+ 2 = 7 Required Please enter the correct value. The Dow Jones today fell over 150 points in pre-market trading as a political crisis in Italy threatened the economic stability of the Eurozone. Hours before a populist coalition was expected to take control of the Italian parliament, Italian President Sergio Mattarella refused to appoint a euro-skeptic economist to an important government post, forcing a breakdown of the coalition. Over the weekend, Italy’s prime minister appointed a former International Monetary Fund official as interim prime minister in an effort to form a new government and restore order to Europe’s third-largest economy. Now here’s a closer look at today’s most important market events and stocks. It looks like the deal between Fox and Disney is about to die on the vine. And if you are smart enough to get out in front of this event, you could make 10 times your money. We're about to reveal a little wealth secret that could unlock the trade of a lifetime. Money Morning Special Situation Strategist Tim Melvin takes you inside what could easily be a 10-bagger for investors in the weeks ahead. Read more right here. The euro has plunged to its lowest point against the U.S. dollar in 2018 thanks to political problems in Europe. 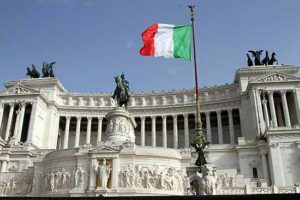 The breakdown of power in Italy has raised new concerns about the nation’s ability to repay its debts, as the spread between German and Italian bonds has widened. Market instability has also spread to Spain, where the nation’s parliament is preparing to vote on whether to oust Prime Minister Mariano Rajoy and his party. Oil prices slid on news that OPEC and Russia will consider hikes in production during a meeting in Vienna, Austria, on June 22. The news accompanied reports that U.S. production is expected to rise throughout the summer. The price of WTI oil sat at $67.20 per barrel. The Brent crude oil price recovered this morning, adding 1%, to hit $76.12. Canadian banks are under pressure this morning over a major breach by cyber criminals. The Bank of Montreal (NYSE: BMO) and the Canadian Imperial Bank of Commerce (NYSE: CM) – the two largest banking institutions in the country – announced that roughly 90,000 customers’ data may have been stolen. This would be the first major cybersecurity event to happen in Canada involving financial firms. Salesforce.com Inc. (NYSE: CRM) will lead a busy day of earnings reports on Wall Street. The cloud computing giant is set to report fiscal first-quarter 2019 numbers after the bell on Tuesday. Starbucks Corp. (Nasdaq: SBUX) will temporarily close about 8,000 locations on Tuesday to train roughly 175,000 employees on racial bias. The training sessions were announced after two African American men were arrested at a location in Philadelphia while waiting for a third party to arrive. Shares of Momo Inc. (Nasdaq: MOMO) popped more than 9% after the Chinese social media firm easily beat earnings expectations this morning. The company owns a number of different media firms, including online dating sites in China. The firm’s monthly active users jumped by 21% compared to the same time in 2017. Look for additional earnings reports from VMWare Inc. (NYSE: VMW), Hewlett-Packard Co. (NYSE: HPQ), JA Solar Holdings Co. Ltd. (Nasdaq: JASO), Momo Inc. (Nasdaq: MOMO), HEICO Corp. (NYSE: HEI), and Booz Allen Hamilton Holding Corp. (NYSE: BAH).